Welcome to the new volume of Supernova! We have taken a step back and for a fresh perspective on your favourite kids’ magazine. It’s incredible how looking at something from a new view gives you so many fresh ideas. We have kept all of the favourites and updated some parts to make the mag even more fun-filled and fantastic. There are even whole new sections called The Big Picture (p.2) and Writing Whiz (p.13). All the short ‘n crunchy articles are now in the first half of the magazine. Check out Morse Code (p.20) and The Seven Summits (p.22). The longer features start from page 26. 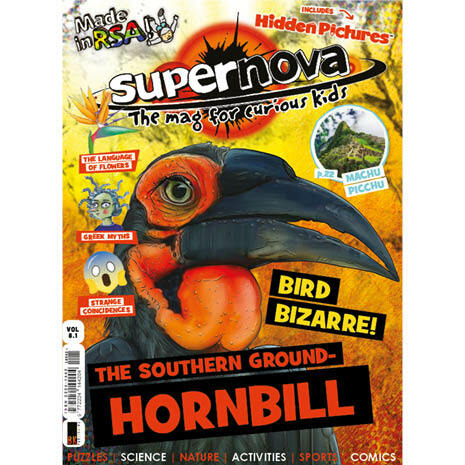 This issue’s feature animal is the southern ground-hornbill. Have you ever spotted one in the wild? If you have, you’re quite lucky because it’s quite a rare find. Find out more about it in Ant’s Eco Adventures (p.26). The longer features include some of the most bizarre coincidences in the world (p.32), the colourful language of some of our indigenous flowers (p.36) and the epic tale of ancient Greek myths (p.40). We hope you enjoy reading this issue! Send us a message and let us know what you think!